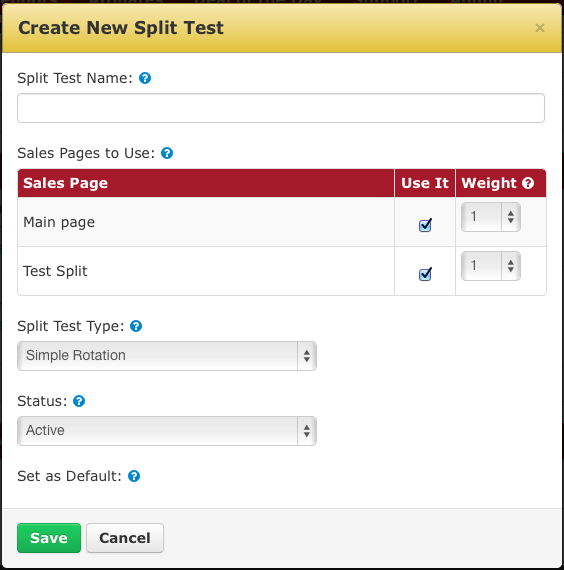 In order to run split tests on your sales pages, you must first have multiple sales pages. 1. Go to "Vendors" in the top menu bar and then click on "offers"
3. Click on the BLUE BUTTON that says "Offer Setup / Options"
4. Click on the item with a bullhorn icon that says "Multiple Sales Pages / Split Tests"
6. Simply create a "Name" for your Split Test, so you can refer to it later. Then SAVE your split test and you're done! Once your split-test is saved, you can then click on the BLUE BUTTON that says "Get Link" to the right of the split-test name, that will give you the URL to send traffic to the particular split test. You can EDIT the split-test by clicking on the pencil icon to the left of the 'Split Test Name' and you can view the stats of the split test by clicking on the bar graph icon.